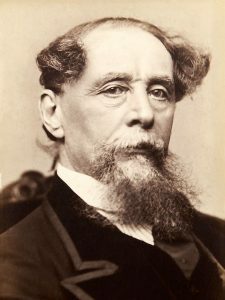 Editor’s Note: “The Signalman” is a short story by Charles Dickens that was first published in Mugby Junction in their 1866 Christmas edition of All the Year Round. 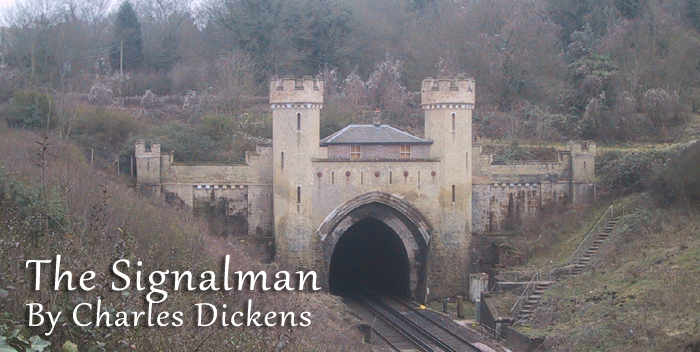 It’s believed the Clayton Tunnel train crash of 1861 likely inspired this story. A century ago, there was a long tradition of publishing and telling ghost stories at Christmastime, it’s a tradition we hope to bring back by re-publishing one of Dickens’s most haunting tales. Enjoy! When he heard a voice thus calling to him, he was standing at the door of his box, with a flag in his hand, furled round its short pole. One would have thought, considering the nature of the ground, that he could not have doubted from what quarter the voice came; but, instead of looking up to where I stood on the top of the steep cutting nearly over his head, he turned himself about and looked down the Line. There was something remarkable in his manner of doing so, though I could not have said, for my life, what. But, I know it was remarkable enough to attract my notice, even though his figure was foreshortened and shadowed, down in the deep trench, and mine was high above him, so steeped in the glow of an angry sunset that I had shaded my eyes with my hand before I saw him at all. He looked up at me without replying, and I looked down at him without pressing him too soon with a repetition of my idle question. Just then, there came a vague vibration in the earth and air, quickly changing into a violent pulsation, and an oncoming rush that caused me to start back, as though it had force to draw me down. When such vapour as rose to my height from this rapid train, had passed me and was skimming away over the landscape, I looked down again, and saw him re-furling the flag he had shown while the train went by. I repeated my inquiry. After a pause, during which he seemed to regard me with fixed attention, he motioned with his rolled-up flag towards a point on my level, some two or three hundred yards distant. I called down to him, ‘All right!’ and made for that point. There, by dint of looking closely about me, I found a rough zig-zag descending path notched out: which I followed. The cutting was extremely deep, and unusually precipitate. It was made through a clammy stone that became oozier and wetter as I went down. For these reasons, I found the way long enough to give me time to recall a singular air of reluctance or compulsion with which he had pointed out the path. When I came down low enough upon the zig-zag descent, to see him again, I saw that he was standing between the rails on the way by which the train had lately passed, in an attitude as if he were waiting for me to appear. He had his left hand at his chin, and that left elbow rested on his right hand crossed over his breast. His attitude was one of such expectation and watchfulness, that I stopped a moment, wondering at it. I resumed my downward way, and, stepping out upon the level of the railroad and drawing nearer to him, saw that he was a dark sallow man, with a dark beard and rather heavy eyebrows. His post was in as solitary and dismal a place as ever I saw. On either side, a dripping-wet wall of jagged stone, excluding all view but a strip of sky; the perspective one way, only a crooked prolongation of this great dungeon; the shorter perspective in the other direction, terminating in a gloomy red light, and the gloomier entrance to a black tunnel, in whose massive architecture there was a barbarous, depressing, and forbidding air. So little sunlight ever found its way to this spot, that it had an earthy deadly smell; and so much cold wind rushed through it, that it struck chill to me, as if I had left the natural world. This was a lonesome post to occupy (I said), and it had riveted my attention when I looked down from up yonder. A visitor was a rarity, I should suppose; not an unwelcome rarity, I hoped? In me, he merely saw a man who had been shut up within narrow limits all his life, and who, being at last set free, had a newly-awakened interest in these great works. To such purpose I spoke to him; but I am far from sure of the terms I used, for, besides that I am not happy in opening any conversation, there was something in the man that daunted me. The monstrous thought came into my mind as I perused the fixed eyes and the saturnine face, that this was a spirit, not a man. I have speculated since, whether there may have been infection in his mind. Intently watchful of me, he replied (but without sound), Yes. His manner cleared, like my own. He replied to my remarks with readiness, and in well-chosen words. Had he much to do there? Yes; that was to say, he had enough responsibility to bear; but exactness and watchfulness were what was required of him, and of actual work–manual labour he had next to none. To change that signal, to trim those lights, and to turn this iron handle now and then, was all he had to do under that head. Regarding those many long and lonely hours of which I seemed to make so much, he could only say that the routine of his life had shaped itself into that form, and he had grown used to it. He had taught himself a language down here–if only to know it by sight, and to have formed his own crude ideas of its pronunciation, could be called learning it. He had also worked at fractions and decimals, and tried a little algebra; but he was, and had been as a boy, a poor hand at figures. Was it necessary for him when on duty, always to remain in that channel of damp air, and could he never rise into the sunshine from between those high stone walls? Why, that depended upon times and circumstances. Under some conditions there would be less upon the Line than under others, and the same held good as to certain hours of the day and night. In bright weather, he did choose occasions for getting a little above these lower shadows; but, being at all times liable to be called by his electric bell, and at such times listening for it with redoubled anxiety, the relief was less than I would suppose. He took me into his box, where there was a fire, a desk for an official book in which he had to make certain entries, a telegraphic instrument with its dial face and needles, and the little bell of which he had spoken. On my trusting that he would excuse the remark that he had been well-educated, and (I hoped I might say without offence), perhaps educated above that station, he observed that instances of slight incongruity in such-wise would rarely be found wanting among large bodies of men; that he had heard it was so in workhouses, in the police force, even in that last desperate resource, the army; and that he knew it was so, more or less, in any great railway staff. He had been, when young (if I could believe it, sitting in that, hut; he scarcely could), a student of natural philosophy, and had attended lectures; but he had run wild, misused his opportunities, gone down, and never risen again. He had no complaint to offer about that. He had made his bed and he lay upon it. It was far too late to make another. All that I have here condensed, he said in a quiet manner, with his grave dark regards divided between me and the fire. He threw in the word ‘Sir’ from time to time, and especially when he referred to his youth: as though to request me to understand that he claimed to be nothing but what I found him. He was several times interrupted by the little bell, and had to read off messages, and send replies. Once, he had to stand without the door, and display a flag as a train passed, and make some verbal communication to the driver. In the discharge of his duties I observed him to be remarkably exact and vigilant, breaking off his discourse at a syllable, and remaining silent until what he had to do was done. He thanked me, and went out at the door with me. He wished me good night, and held up his light. I walked by the side of the down Line of rails (with a very disagreeable sensation of a train coming behind me), until I found the path. It was easier to mount than to descend, and I got back to my inn without any adventure. Punctual to my appointment, I placed my foot on the first notch of the zig-zag next night, as the distant clocks were striking eleven. He was waiting for me at the bottom, with his white light on. ‘I have not called out,’ I said, when we came close together; ‘may I speak now?’ ‘By all means, sir.’ ‘Good night then, and here’s my hand.’ ‘Good night, sir, and here’s mine.’ With that, we walked side by side to his box, entered it, closed the door, and sat down by the fire. ‘Into the tunnel,’ said I. That was all very well, he returned, after we had sat listening for a while, and he ought to know something of the wind and the wires, he who so often passed long winter nights there, alone and watching. But he would beg to remark that he had not finished. ‘This,’ he said, again laying his hand upon my arm, and glancing over his shoulder with hollow eyes, ‘was just a year ago. Six or seven months passed, and I had recovered from the surprise and shock, when one morning, as the day was breaking, I, standing at that door, looked towards the red light, and saw the spectre again.’ He stopped, with a fixed look at me. Once more, I followed his action with my eyes. It was an action of mourning. I have seen such an attitude in stone figures on tombs. Involuntarily, I pushed my chair back, as I looked from the boards at which he pointed, to himself. He bit his under-lip as though he were somewhat unwilling, but arose. I opened the door, and stood on the step, while he stood in the doorway. There, was the Danger-light. There, was the dismal mouth of the tunnel. There, were the high wet stone walls of the cutting. There, were the stars above them. ‘Do you see it?’ I asked him, taking particular note of his face. His eyes were prominent and strained; but not very much more so, perhaps, than my own had been when I had directed them earnestly towards the same spot. We went in again, shut the door, and resumed our seats. I was thinking how best to improve this advantage, if it might be called one, when he took up the conversation in such a matter of course way, so assuming that there could be no serious question of fact between us, that I felt myself placed in the weakest of positions. When I saw him in this state, I saw that for the poor man’s sake, as well as for the public safety, what I had to do for the time was, to compose his mind. Therefore, setting aside all question of reality or unreality between us, I represented to him that whoever thoroughly discharged his duty, must do well, and that at least it was his comfort that he understood his duty, though he did not understand these confounding Appearances. In this effort I succeeded far better than in the attempt to reason him out of his conviction. He became calm; the occupations incidental to his post as the night advanced, began to make larger demands on his attention; and I left him at two in the morning. I had offered to stay through the night, but he would not hear of it. That I more than once looked back at the red light as I ascended the pathway, that I did not like the red light, and that I should have slept but poorly if my bed had been under it, I see no reason to conceal. Nor, did I like the two sequences of the accident and the dead girl. I see no reason to conceal that, either. But, what ran most in my thoughts was the consideration how ought I to act, having become the recipient of this disclosure? I had proved the man to be intelligent, vigilant, painstaking, and exact; but how long might he remain so, in his state of mind? Though in a subordinate position, still he held a most important trust, and would I (for instance) like to stake my own life on the chances of his continuing to execute it with precision? Unable to overcome a feeling that there would be something treacherous in my communicating what he had told me, to his superiors in the Company, without first being plain with himself and proposing a middle course to him, I ultimately resolved to offer to accompany him (otherwise keeping his secret for the present) to the wisest medical practitioner we could hear of in those parts, and to take his opinion. A change in his time of duty would come round next night, he had apprised me, and he would be off an hour or two after sunrise, and on again soon after sunset. I had appointed to return accordingly. Next evening was a lovely evening, and I walked out early to enjoy it. The sun was not yet quite down when I traversed the field-path near the top of the deep cutting. I would extend my walk for an hour, I said to myself, half an hour on and half an hour back, and it would then be time to go to my signalman’s box. The nameless horror that oppressed me, passed in a moment, for in a moment I saw that this appearance of a man was a man indeed, and that there was a little group of other men standing at a short distance, to whom he seemed to be rehearsing the gesture he made. The Danger-light was not yet lighted. Against its shaft, a little low hut, entirely new to me, had been made of some wooden supports and tarpaulin. It looked no bigger than a bed. ‘What is the matter?’ I asked the men. ‘O! how did this happen, how did this happen?’ I asked, turning from one to another as the hut closed in again. The man, who wore a rough dark dress, stepped back to his former place at the mouth of the tunnel! Without prolonging the narrative to dwell on any one of its curious circumstances more than on any other, I may, in closing it, point out the coincidence that the warning of the Engine-Driver included, not only the words which the unfortunate Signalman had repeated to me as haunting him, but also the words which I myself–not he–had attached, and that only in my own mind, to the gesticulation he had imitated.